ホーム ＞ 外国人の店 ＞ SpeakEasyイベント ＞ 4/15：Russian Crepes Party! Russian Crepes Party! Russian Speakers + Russian Cocktails! ホーム ＞ 外国人の店 ＞ SpeakEasyイベント ＞ 4/8：Hanamatsuri Night! HANAMATSURI is the day of flowers. During all day, in Buddhist temples in Japan, people come and put a special tea (Abacha) or a special drink (Amazake) to celebrate this day. During this night, at Bar Speak Easy we provide you a special night. - Guillaume Taveron, filmmaker, photographer and partner since longtime at Speak Easy will prepare a special photo shoot! - We bring a new dj, from UK, who’ll mix nice music and good beats. - We prépare a very special cocktail based on tea! 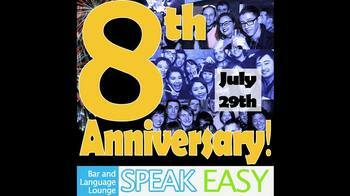 Let’s share this special night all together at Speak Easy! Come with your smile, your friends, and let’s enjoy! International Saturday at Speak Easy Tokyo! Fun & surprises! At bar Speak Easy, we meet a lot of different people. As costumers, but also organizers, people who work for foreigners or try to mix Japanese people and foreigners. To party, to study, to live or just have good time. For this reason, we decided to work with Arigatokyo and our new partner Guidable to provide you a nice saturday night. Let’s join us and meet each other, drink a cocktail and have good time! For this special night we prepare a lot of good things. Special cocktails, nice music provided by Dj D-style, cool atmosphere, nice people and many more surprises. You just need to come with your smile, your friend(s), and enjoy this night with all of us!